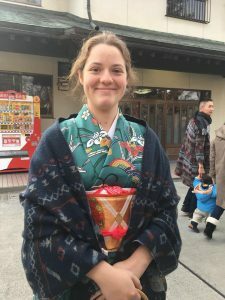 Laura Payne, a 2017 graduate of Southern Oregon University, is an Assistant Language Teacher in the JET Programme in Shi mane, Japan. Ed Battistella: Tell us about the program you teach in? How did you find it? What was the application and training process like? Laura Payne: I work with the Japan Exchange and Teaching (JET) Program. I first heard about it through a brochure I found at a Japanese cultural event in Portland, and I applied for it during the senior year of my undergraduate studies. The application process took about six months from when I first applied to when I was accepted. It included sending in a paper application, letters of recommendation, and a written essay. In addition, I had to go to an interview at the Japanese Consulate in Portland. My first month or so in Japan was spent settling in and preparing for the job. I spent two days in Tokyo at a general orientation and participated in another two day orientation once I arrived at the prefecture I had been assigned to. I also met with the teachers and principals of the schools I was going to work with. EB: How did you get interested in teaching abroad? LP: In my junior year of college, I studied abroad in Japan for six months. During that time, I took on a part-time tutoring job and volunteered with the university’s English Salon. I really enjoyed the experiences of meeting new people and helping them learn a new language. I had already realized by that time that I wanted to be a teacher, but after studying abroad, I could see myself teaching English in Japan. I thought I could learn so much from the experience, and after I went back to the U.S., I immediately wanted to go back to Japan. From there, I remembered the JET Program and decided to apply. EB: Did you experience any sort of culture shock? LP: Nothing related to a difference in culture, but definitely something related to a difference of language. One of my favorite things to do in the U.S. is browse around a library and check out whatever book happens to catch my eye. I can’t do that in Japan, though. Most of the books at the library closest to my apartment are, of course, in Japanese. I use Japanese books as language study tools sometimes, but I don’t know enough Japanese yet to just relax into a story like I do when I read a book in English. There are some English books at the library as well, but that section is only made up of one set of shelves. None of the books in this section are current, and those books that belong to a series are often missing a volume. Experiences like this are difficult for me because in the U.S. I read so much, but in Japan, I’m partially illiterate. I’m trying to learn more Japanese to work past this. EB: You had studied Japanese before. Did that help? What new things have your learned? LP: Yes, knowing Japanese has helped me a lot. The JET Program doesn’t require you to know Japanese, but having a basic knowledge of it has helped me to be much more present in my everyday life. I can have conversations with staff members other than the English teachers at my schools. If my students don’t understand when I try explain something in English, I can switch to Japanese. Moreover, I can explore the area I live in knowing that I can handle all of the basic interactions I’ll run in to. In short, knowing Japanese has helped me to get more out of the experience of teaching abroad than I ever could have only knowing English. EB: What was the experience of managing a class like? Interesting because I’m actually not in charge of managing a class. I team teach classes with Japanese teachers of English, and they’re the main teachers in charge of the classroom. Also, I don’t go to the same classes every day, so most of what I do in the way of managing classes involves matching the style of the class and the teacher I’m currently with. In quieter classes, this might mean just following the lesson plan. In noisier classes, this might mean encouraging students to stay on task. In every situation, I try to get to know the English teacher and the students I’m working with as best as I can so that I can play whatever support role they need me to. EB: What was been your most rewarding experience? LP: Just getting to know my students day by day and helping them with their goals has been a great experience. So many of my students are funny, charming, upbeat individuals who can light up a room just by being present. Sometimes, I get the opportunity to help with extracurricular activities like coaching students who want to participate in English speech or recitation contests. I always love opportunities like these, because I’m so proud of the time and effort students put in to practicing, and I’m so happy for them when their hard work pays off. Now that I’ve started my second year teaching in Japan, I’m starting to see some of my students grow as they move on to different grade levels. All of this is incredibly rewarding because I know that every one of my students has their own dreams for the future, and I love seeing them try to figure out how they can get closer to those dreams through school. LP: Since coming to Japan, I’ve decided that I want to earn a graduate degree in teaching English as a second language as well as a Secondary Education Language Arts degree. I’ve discovered that I really enjoy teaching English as a second language, and I want to keep doing it. I also think that the fact that I have experience learning a second language in a foreign country will help me serve students in ESL classes well. In addition, because of the experiences I’ve had here and the people I’ve met here, I want to keep a connection with Japan for the rest of my life. My ultimate dream is to work in a school with a Japanese sister city so that I can continue helping with international education programs. EB: Any suggestions for others considering teaching abroad? LP: If you think teaching abroad is something you would like to do, I can’t recommend it enough! Do some research on different programs and countries and find a way that’s a good fit for you. I’m sure you can find one.